The 81st Annual Conference will take place from August 4-7 at the Tampa Marriott Waterside Hotel & Marina in Tampa. This single day conference registration option includes all general sessions, choice of breakout sessions and all food functions on the day for which you register. Refunds will not be made for food functions not attended. Full refunds, less a $75 handling charge, will be made with written cancellation prior to July 8, 2019. No refunds will be made for any reason after July 8. The Golden Image Banquet and President's Welcome Reception are not included in the single day registration fee, but registrants can attend these events for an additional fee. Conference attire is professional business. Please note that the average temperature in the hotel is 72 degrees. To ensure comfort, attendees may want to have a sweater or jacket available. Register early, the single day conference registration fee increases after July 22. *Registrations will not be processed until the check has cleared. The fees for the events listed below are not included in your Single Day Member Conference registration. Please indicate if you would like to attend for an additional fee. If you are registering for Monday, the Presidents' Luncheon is included in your registration fee. Please indicate if you would like to bring a guest, for an additional fee, to that or any other of the add-ons that you're planning to attend. If you add the items below, their cost will be added to the total cost of your registration. You can also purchase guest tickets separately by selecting Guest Ticketing in the Annual Conference (Member Rates) section of the store. This option allows you to pay separately for your Single Day Registration and your guest tickets. Do you have a disability or physical limitation where accommodations or assistance would be helpful? If yes, please indicate your needs below. Vegetarian meals are only available if requested IN ADVANCE. Please indicate below if you would prefer vegetarian meals, or have any other dietary restrictions. Anyone failing to make special diet requests will be responsible for covering any related costs. Is this your first time attending an FPRA Annual Conference? If no, when was the first time you attended conference? When did you first attend conference? 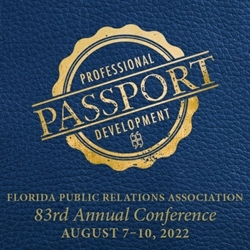 In celebration of FPRA's 80th Annual Conference, do you have a fun and/or inspiring FPRA story you would like shared on our FPRA history wall that will be displayed at conference?